He Backtracked, But Did She? Not every immigrant stayed in their new country. That’s the apparent case with Gerd Behrens who arrived in the United States in 1858. Gerd and Trientje (Claassen) Behrens arrived on 28 August 1858 in New York City on board the New York. Their destination per the manifest was Illinois and listed directly after Gerd and Trientje was the family of their daughter Gretje Ostendorf. The Behrenses and the Ostendorfs settled in Clayton Township, Adams County, Illinois, where the sons of Gerd and Trientje had already settled. Their arrival in 1858 meant that parents and children were all reunited. There were no remaining children of Gerd and Trientje in Germany. Gerd and Trientje are enumerated in Clayton Township, Adams County, Illinois, in the 1860 federal census as Gerrett and Twuga Barnes. Gerd Behrens died on 21 June 1867 in Ludwigsdorf/Weene, Ostfriesland, Germany according to his entry in Die Familien der Kirchengemeinde Weene (1671-1911). Trientje (Claassen) Behrens is enumerated in the 1880 federal census in Clayton Township, Adams County, Illinois, with son Ulfert Behrens and his family. 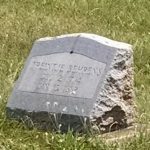 Trientje died in 1881 and is buried in the South Prairie Cemetery near Golden, Adams County, Illinois. One scenario constructed from the known information is that both Gerd and Trientje returned to Germany because they were unhappy in America. Then after Gerd’s death, Trientje returned. That’s one scenario. Trientje has not been located on a return manifest entering the United States between June of 1867 and her 1880 census enumeration. Trientje would have been seventy-three years old when her husband died. The other possible scenario is that Gerd returned to Germany by himself, either for a visit or permanently. Just because he died in Ludwigsdof/Weene does not mean that Trientje was there at his side. I also really can’t say if he was “happy” in the United States or not. One has to stick with what the records say and the scenarios supported by the records. What’s missing at this point is the 1870 census. An organized search for Trientje in 1870 needs to be conducted. This search should include the concomitant spelling variations for Behrens (and there are many) using various online census indexes. A manual search should be conducted in Clayton Township and nearby locations as she most likely is living near the area where her children settled. The 1870 census enumerations for all her known children should be referenced to see if she is living with one of them under a name spelling that eludes database searches. She may not be living with one of them in 1870, but their entries should be searched just the same. 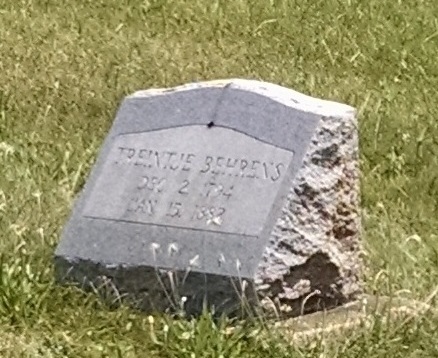 Stone of Trientje (Claassen) Behrens–South Prairie Cemetery, Golden, Adams County, Illinois. I should continue trying to search for Trientje in passenger list databases for the 1867-1880 time period, documenting my search parameters and search process. During these searches I will remind myself that Trientje did not necessarily immigrate. The death entry for Gerd is from a compiled ortssippenbuch for Weene. It is possible that actual church records make some mention of Trientje. At this point, I cannot say whether Trientje went back or not. All I know is the bulleted information above that indicates Gerd did go back. Arrival date and ship’s name for Gerd and Trientje given here should agree with those in the table posted July 19. 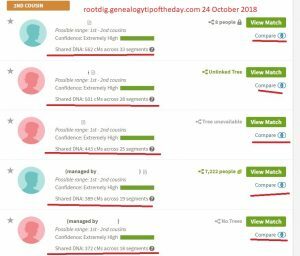 They do–individuals in the chart are listed by their maiden name and I neglected to include Trientje’s maiden name in this post (which I just corrected). The Trientje Behrends listed on the chart is the granddaughter of the Gerd and Trientje (Claassen) Behrends referred to in this post. The Ulfert shown is the father of Trientje and the son of Gerd and Trientje (Claassen) Behrends. I’ve not updated the chart yet; the Gerd and Trientje (Claassen) are still listed as 1850s with no specific dates. I need to do that. I do need to decide how I am spelling Behrends. It can be difficult to make data in a chart as intelligible as in a narrative. I have had a similar problem with a FAN group that is not principally based in one document. That’s right-it’s difficult to always include everything in a chart that would help to clarify. And some families made the problem even worse by using the same names repeatedly. This is a very intetesting concept.I will check into this thought. If Gerd Behrens died in Germany there must be some sort of arrangement of his heritage. Over here in the Netherlands we have a ‘Memorie van Successie’ that is a certificate made up for the taxes that had to be paid over the deceased heritage. I am sure that there is a same sort of procedure in Germany. This would give a lot of information on the where abouts of his wife and children! That’s a good idea. I will have to look into that.